A refreshing fusion of honesty and artistry, the compositions are auditory snapshots of a deeply transformational phase in his career, ripe with inflections that listeners can feel rather than hear. 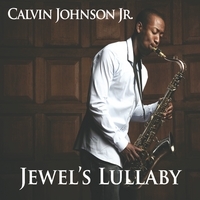 Calvin Johnson Jr.’s debut CD, Jewel’s Lullaby, is projected to soar because of its refreshing fusion of honesty and artistry. Its songs are auditory snapshots of a deeply transformational phase of his life, ripe with inflections that listeners than feel rather than hear. Johnson’s treatment of “So Near, So Far” plays with the concept of musical layers; instruments and cadences complement one another on a track that feels beautifully paradoxical. “Amazing Grace” offers the resonance of a small town church, with its sentimental yet undeniably powerful tone. While the song was intended for a sax quarter, Johnson plays each part of this track himself, conveying his own artistic evolution. “I was reflecting on a very personal loss and it felt like divine intervention. I had to do this song. Something or someone was standing over me to guide me,” he reflects. Inspired by muses and driven by a family legacy, Calvin Johnson, Jr. has already captured attention from mentors and peers with this new project. Thrilled to present Jewel’s Lullaby to the music world, his upcoming performances promise a very personal introduction to himself, his band, and their sound.